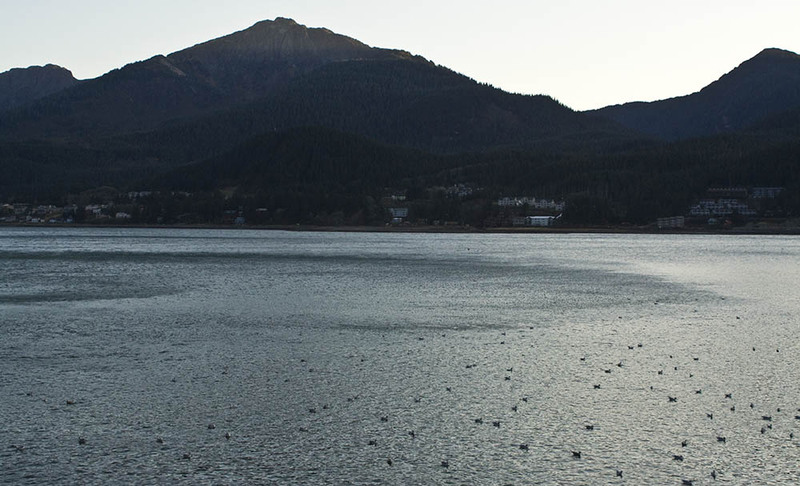 I’m in Juneau for the Alaska Math and Science Conference and enjoying the sun and the beautiful blue sky. Blue sky does not necessarily equate to “fair” weather here. The Taku winds were blowing yesterday (10/13) and probably still are, though weakening. The photo above looks east across the Channel at Downtown. 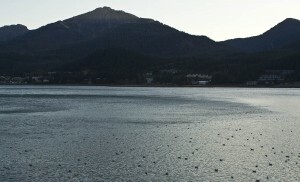 It is a wide shot to show the layout of the land but you still can see the numerous vigorous whitecaps coming toward the camera (click on image for a larger version). I’ve posted some closer shots below the weather map and explanation. Surface map from approximate time of photos. On the map you can see a high pressure area well inland of Southeast Alaska and a healthy low off the coast of Vancouver Island. The strongest pressure gradient (indicated by where the pressure contours, or isobars, are packed the tightest) is right over Southeast Alaska. 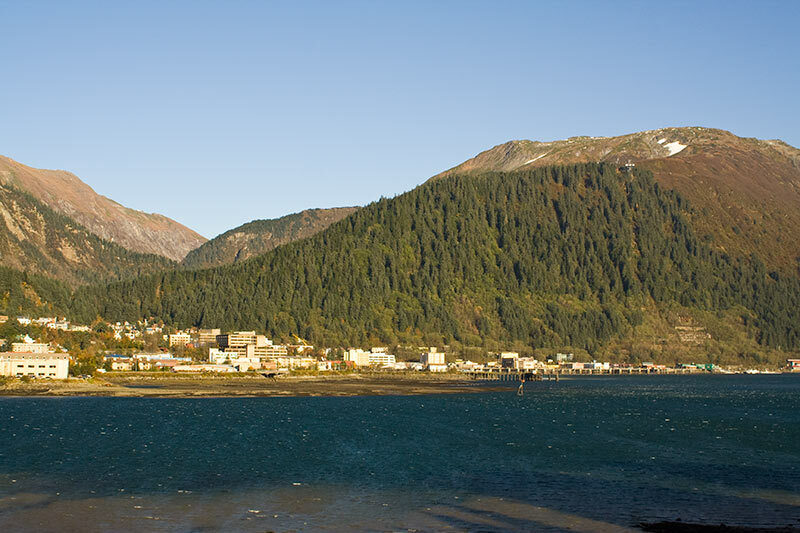 Taku winds are named after the Taku Inlet (a little south of Juneau) and famously ferocious there and in Juneau. The temperature of the source air of these winds is a big factor in their strength. In winter, the air over the continent is usually colder than that over the ocean. Other factors aside for the moment, cold air is more dense than warm air, and gravity is going to take advantage of that fact. As the air is pulled off the continent by the low pressure area, the gravity is aiding its trip down the slopes of the coastal mountains. If the air over the ocean were relatively more dense, the down-moving air would not have as easy a time displacing it. This is more often the case with the Anchorage area Chugach Mountain winds. When the pressure gradient sets up to draw air over those mountains, the source air (usually coming off Prince William Sound) is usually warmer than the air at the base of the mountains (in Anchorage) it is trying to replace. When that happens the mountain winds blow over the top of the cold surface air. In many cases, however, the up and down wave action set up by the mountains can eventually erode the cold air, allowing the winds to reach the surface. This next shot was taken from the east side of the Channel (near the library) and show how the downdrafts hit the water and spread out in most if not all directions. A windsurfer out there would have to watch his back! I’d love to hear about the current weather pattern. Why are we so warm?